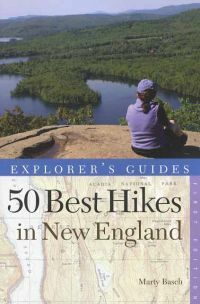 50 Best Hikes in New England, by Marty Basch, 2014. A veteran New England hiker presents his choices for must-do hikes in all six New England states, from lowland rambles in Rhode Island to the high peaks of New Hampshire, Vermont and Maine. Each description is accompanied by color topo map and color photos. 256 pp., 6" X 9."